I kid you not, I think I have worn jeans at least three times a week for the past year. Not to say that's necessarily a bad thing, but I have wanted to get back into the swing of wearing skirts again. However, nothing spoke to me until I came across this particular midi skirt style that I think is the best in the market right now. 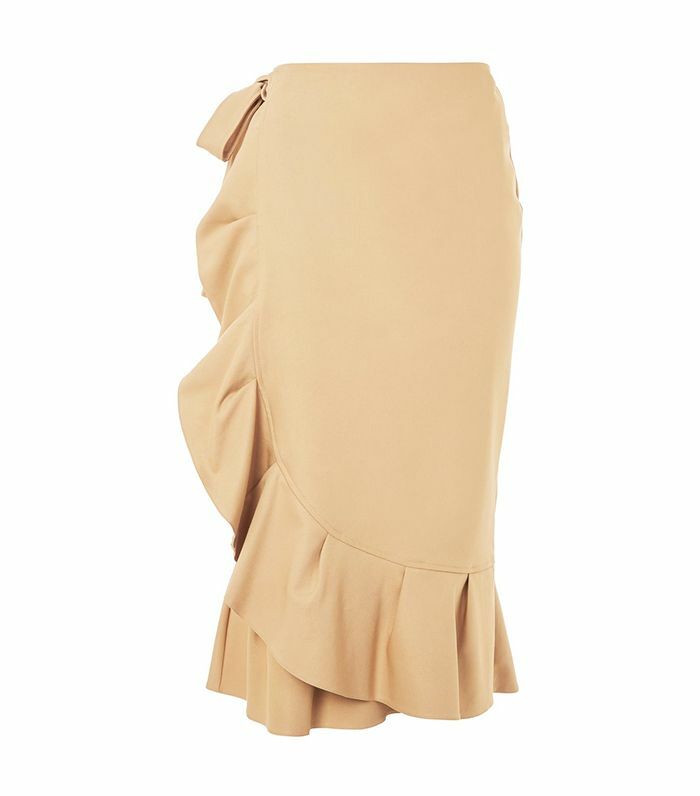 The style is midi in length, has ruffles along the hem or somewhere else on the skirt (typically cascading in a flattering diagonal), and a majority of them either are a wrap skirt or at least appear to have a faux wrap effect. Since the precise cut doesn't have a name yet, explaining all the nuances was necessary. Thank you for your patience. The moment I tried this skirt on, I felt at home in it. It was the perfect balance of casual and trend-driven, and instantly, I could think of a million places to wear the one I had just invested in. Personally, I love wearing mine with a graphic tee and mules, but I have also tried it with a button-down and courts for a more work-appropriate look. As of now, I only own two skirts that fall within this cascading ruffle midi trend, but I plan on adding on to that mini collection. They always say that when you love something, buy multiples of it, and besides jeans, this was the first item of clothing I applied that infamous fashion law to, and it's made me pretty happy. Go on to see a picture of me wearing one of my favourite cascading ruffle skirts, and shop the style for yourself. Now trending: tablecloths as skirts. ???? I styled this gingham version of the skirt with a white T-shirt and sweater tied around my neck. However, I have also worn this with a black crop top and lace-up sandals on warmer spring days. I'm telling you, this is the skirt trend sent from above. Keep scrolling to shop our favourite pieces from this new skirt trend. Throw on a black tee and mules, and call it a day. You can never have too much gingham. This skirt is styled perfectly. Upgrade your summer party skirt. There's nothing fresher than white ruffles. The elaborate skirt you never knew you needed. The neutral item your crazy prints need. How good would this look with a black hoodie? A style with unexpected details around every corner. Bring out your inner salsa dancer. The easy way to add a feminine touch. Your next vacation is calling you. Be sure not to miss the pleats hiding underneath the ruffles. This summer, all you need is this affordable gingham skirt. Your bikini top's new favourite counterpart. Up next, the French girl we're going a little crazy over.